Weeping and tantrum-filled goodbyes are quite common during a child's earliest years. 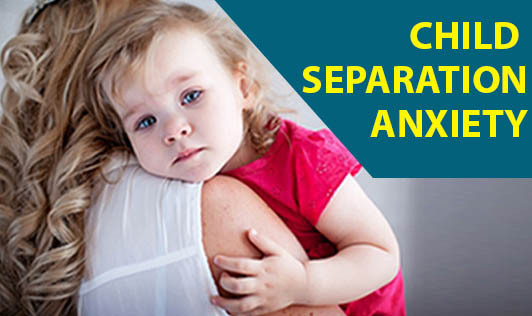 Between ages 8 and 12 months, a child often experiences a period of separation anxiety. This is actually an emotional milestone that a child grows out of eventually. Reason for this is that your child is now beginning to understand that there's only one of you and you still exist when you aren't in sight. This will often trigger tears whenever you leave the room or result in a clingy behavior when you attempt to say goodbye to your child. Practice goodbyes: It is important that you leave your child with a trusted caregiver for short periods of time. By doing so, your child will eventually learn that he or she can count on you to return. Time is everything: Your child may be more likely to become upset easily when you leave, if he or she is tired and hungry. Try and leave when your child is fed and rested. Leave a reminder: Offer a stuffed animal or any other comforting object for your child to hold on to while you're gone. Keep the tears in perspective: Remember that your child's tears are in fact an attempt to keep you from leaving. Once your child is engaged in a new activity, the tears aren't likely to last for very long. Remember not to prolong your goodbyes, and that separation anxiety is a phase that will pass. So, be patient as your child learns that it's OK to spend time doing other things while you're away.